At the heart of the ancient city extends a wide Colonnaded Street. It was built at the end of the 1st century AD, on the traces of an older road. 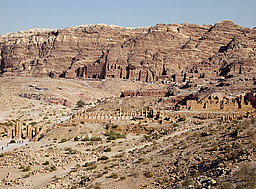 It follows the east-west topography of Wadi Musa, starting at its confluence with Wadi Mataha, where the ruins of the Nymphaeum (public fountain) can still be seen. The centers of power and cult of the city, as well as the markets and residential quarters with clusters of simple stone and clay dwellings, used to be on the slopes on both sides of this main artery. 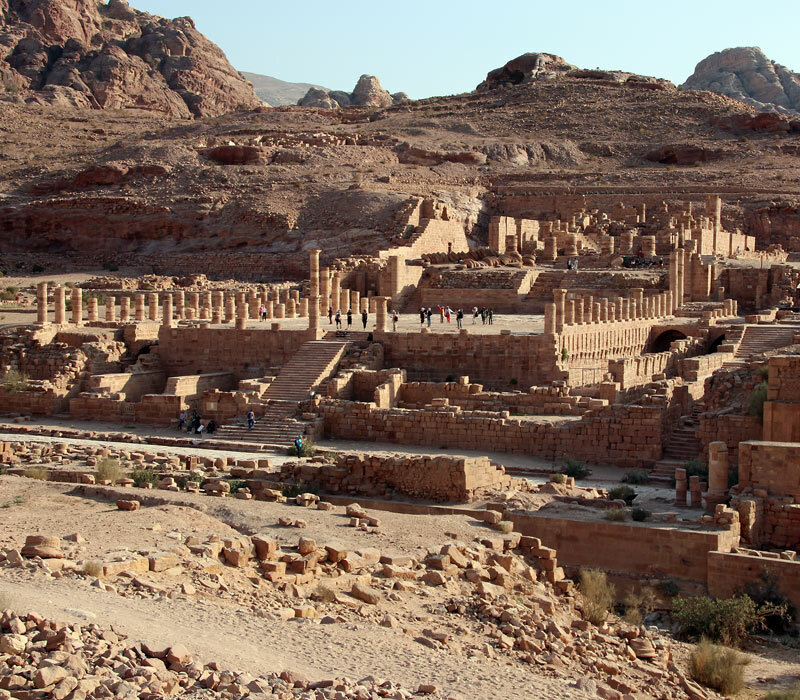 The Great Temple is one of the major architectural components of metropolitan Petra. 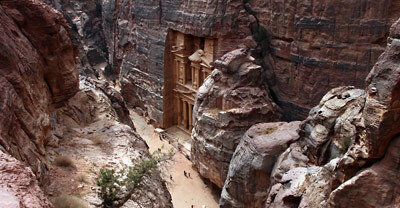 Constructed at the end of the first century BC, it was enlarged during the first 100 years AD. The precinct itself measures 7,560 m2. Located to the south of the Colonnaded Street, it comprises a monumental staircase, a large sacred open-air plaza (Lower Temenos) paved with hexagonal stones enclosed on both lateral sides by triple colonnades, from where east and west stairways lead to the Upper Temenos - the proper temple, which has a tetrastyle (four columns) facade. An unusual feature is the inclusion of a Theatron in the sacred precinct, probably a council chamber, with 13 seating rows, which would have seated up to 600 people. 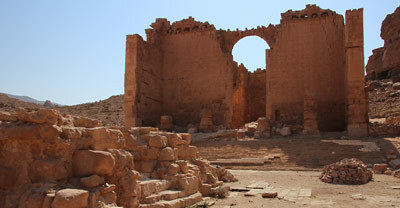 Between the Great Temple and the Qasr Bint, a Nabataean bathhouse was excavated, which is believed to have been used for ritual purification ceremonies.